Quietly competent, and now prettier as well. When HyperX first entered the keyboard market in 2016, it did so in the most unassuming fashion. 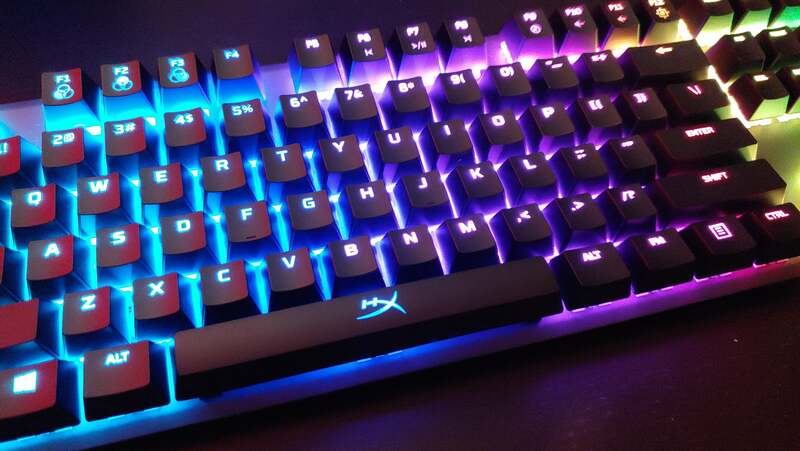 There was a single model, the HyperX Alloy FPS, with an ultra-minimalist design, single-color backlighting (red), and Cherry MX Blue switches. That was it! MX Brown and MX Red models followed in the spring, but even so, it was clear HyperX was just testing the waters. HyperX seems much more comfortable with keyboards these days though, releasing the tricked-out Alloy Elite model last year. And now the unassuming Alloy FPS has received an upgrade, finally getting the full RGB-backlight treatment and new switches. Let’s dig in. The HyperX Alloy FPS RGB looks pretty much identical to its predecessor, and that’s fine by me. It’s a beautiful design, elegant in its simplicity. Few keyboards, especially gaming-centric ones, are this sleek. Its gunmetal backplate and mere half-inch or so of bezel on every side make it a refreshing alternative to the oversized HyperX Alloy Elite—less feature-packed, granted, but more attractive by far. Of course, that “less feature-packed” qualifier might be a deal breaker for some. The Alloy FPS RGB is about as basic as they come. You do get a handful of on-the-fly options double-mapped on the Function row, including your standard media controls, game mode, and rudimentary lighting changes: rainbow, a red “breathing” setting, and a blue mode with white WASD lighting. But that’s pretty much it, and really the lighting controls are the only design change from the original Alloy FPS. I can’t complain too much—I think it’s a great-looking keyboard. I do wish HyperX had rectified some of the issues I pointed out in the original model though. For instance, keyboards with Cherry MX-style switches are all forced to deal with the same backlight problem: To compensate for the “stem” design of the switch, the LED is offset above it. Thus the top of the key is lit beautifully, while the bottom looks dimmer. 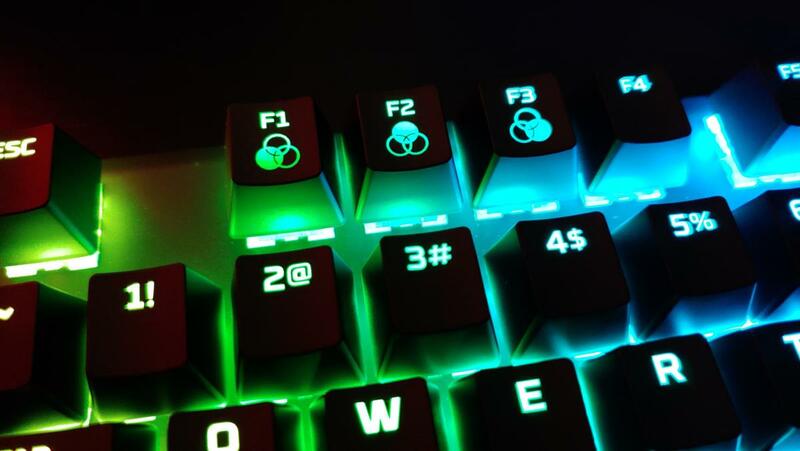 Manufacturers deal with this in different ways, but HyperX chooses to arrange both the primary and secondary functions of many dual-mapped keys on the top edge, for instance with the “1” and “!” symbols side-by-side. It looks cramped, in my opinion. Then there’s the USB port, which continues to defy logic. On the rear you’ll find a USB-A port which usually indicates the presence of USB passthrough. Not here, though! The Alloy FPS passes power but not data through this port, so you can charge your phone but not, you know, plug a mouse into it or any of the various devices you’d actually want to use. Still, it’s a great little keyboard. I really do love the size of it, and actually kept the original Alloy FPS on my desk for a number of months after review because it took up so little space. If you want a full-sized keyboard that feels almost like a tenkeyless, this is one of the best options. HyperX included a bag with the original Alloy FPS, which is not included with the new RGB model (as far as I could tell). I can’t say I’m surprised. Not many people move their keyboard around day-to-day, and I assume even fewer think it needs the protection afforded by a soft cloth bag. That said, the cabling is still fully removable. I’m a big fan of that feature, at least. If the cable goes, you can just swap it for another USB-A to Mini-B and you should be back up and running. Maybe you noticed, but I did say “Cherry MX-style switches” above. 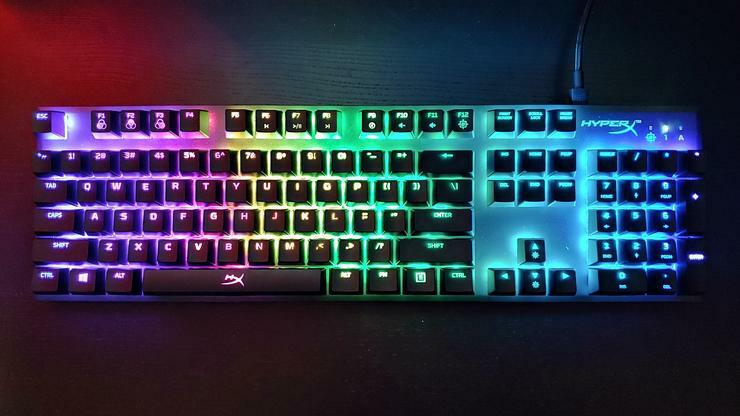 HyperX has moved away from official Cherry switches for the Alloy FPS RGB, which is unexpected since the Alloy Elite RGB we reviewed just last year used bona fide Cherry MX (and still does, according to HyperX’s website). But when it came time to make the Alloy FPS RGB, apparently HyperX opted for Kailh Silver Speed switches instead of Cherry. Do they actually like Kailh more? Is it just a cost-cutting measure? It’s honestly hard to tell. Either way, the differences are slight. Cherry MX Silvers are a linear switch requiring 45 grams of force, with an actuation of 1.2mm and a travel of 3.4mm. Kailh Silvers require 40 grams of force, with an actuation of 1.1mm and travel of 3.5mm. I’m finding the Kailh switches a bit noisier than the equivalent Cherry switches, but that’s the only noticeable difference. Both are extremely lightweight keys and take a bit of getting used to, especially when typing. The switches require so little force and the actuation is so close to the top, it’s easy to brush keys and make mistakes. In any case, it’s your only option here. That’s a bit surprising as well—the rest of HyperX’s keyboards come in Cherry MX Blue, Brown, and Red variants, but you’re stuck with Silvers here. I find Silvers great for gaming but a real pain for day-to-day use, so it’s something to be aware of before you rush out and get an Alloy FPS RGB. Time to update you on the state of HyperX’s software. Reviewing the Alloy Elite RGB last year, I noted that HyperX’s Ngenuity utility took up a whopping 1.1GB of space after installation. Gigabytes! That’s just...incredible. Completely untenable, as well. These software utilities are already sneered at by power users, with comparable offerings by Logitech and Razer taking up approximately 300MB of space. That’s unwieldy, sure, but 1.1GB? 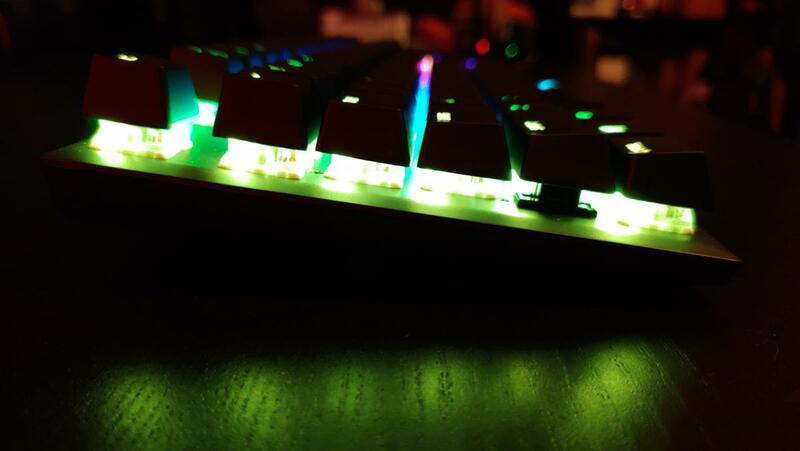 To change the lighting on your keyboard? Ridiculous. And unfortunately nothing’s changed. Ngenuity still takes up 1.1GB, all these months later. I still don’t understand why it takes up so much space to begin with, nor do I understand how HyperX hasn’t addressed the issue by now. I have games installed on my PC—recent ones, even—that take up less space. Luckily the Alloy FPS RGB stores three different profiles in onboard memory, so you can download Ngenuity, tweak your settings, and then blast the damn monstrosity off your SSD never to return. Ngenuity aside, I think the HyperX Alloy FPS RGB is a pretty great keyboard. 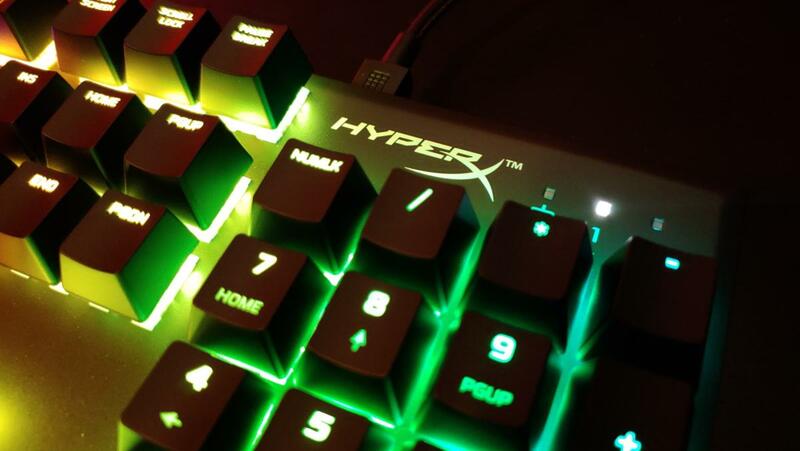 As with the rest of HyperX’s keyboard lineup, it doesn’t really do anything to stand out. It’s quietly competent though, with an attractive design and backlighting, enough features to keep your average user happy, and a price point ($110 list) in line with the competition. I still wish we’d see something more daring out of HyperX, using more of the approach that’s allowed them to dominate the headset market. If “quietly competent” sells keyboards, however, who am I to complain?